those two crazy snow storms I am able to wear this spring-like dress? I had to do a detail shot. Okay, so I am finally mustering up the courage to do a VLOG. I am going to do a Q & A vlog! So.... game on. I will most likely make the post in the next few days or so. are having a fabulous Monday and Happy Valentines day! 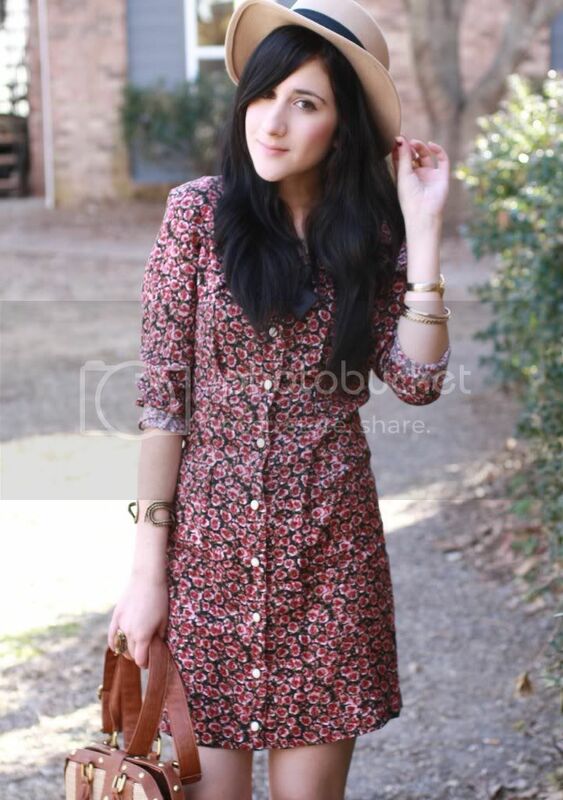 wearing: vintage dress via Paint A Dress; kimchi blue bag; Nasty Gal hat; Jeffrey Cambell 'miracle' wedge. oh i am in love with your dress. i am also thrilled over the warmer weather!!! I love every thing here! specially the bag and the hat! my question is: what do you do for a living? Very pretty dress! I'm also feeling quite Spring-y, but sadly haven't got the warmth to match. A question: how long does it take you to come up with an outfit? Honestly? Another question (am I allowed more than one? ): what do you wear for lounging/sickdays/TV time? beautiful dress and i actually envy the fact you can walk around with bare legs! its cold and windy where i live, boooo. you should tell us about where you live, it looks so beautiful! I adore this outfit so so much! The dress is too perfect I love it, from the floral print to the buttons to the fit, it's gorgeous. Your dress is perfect for Valentine's Day! And that bow is adorable! Wishing you a great day! im wondering how you make yourself look so tall, b/c you're only 5'4" right? i'm 5' and any tricks to help would be greatly appreciated. also, your hair rocks...do you believe in washing everyday, or less often..? Your bag is such a classic beauty, I hate that you look so springy and warm! that dress is sooo beautiful and very romantic. happy valentine bonnie! hope you have an amazing v-day adventure with your bf. -Who are your favorite people? -What are your favorite blogs? I really love the little black bow on the dress - the whole thing is really lovely! love the bow on it! Hope you enjoyed your Vday night! You look gorgeous woohoooooo legs hello!! your clothes are so adorable, I really love your dress. You look incredible! This dress is so pretty. I think the seasons must be changing, its getting much colder here, i think Winter is on the way! You're so gorgeous! And I'm so jealous that you actually get to wear a dress! I'm still waiting for sunshine. Love the pattern on the dress too. Super cute! And I can't wait to see your vlogggg! You look amazing. Happy Valentine's Day! I swear, you are constantly inspiring me to try the socks with shoes like that, I need to go for because I just love the look! Spring has come where I am too :) So many more possibilities! Happy heart day for you too doll, your outfit is perfect to celebrate love and girlyness! ps- Love the new header, is so you! What fashion style - or item - do you think you can't (or wouldn't want to) pull off? Hope you have a great valentines night, that dress is lovely! you look beautiful! your dress is so nice! and im glad your feeling better!! happy valentine's day many hugs to you! I'm adding you to my "favorites" list on my blog! Lovely! Looks so nice!! I adore the dress! 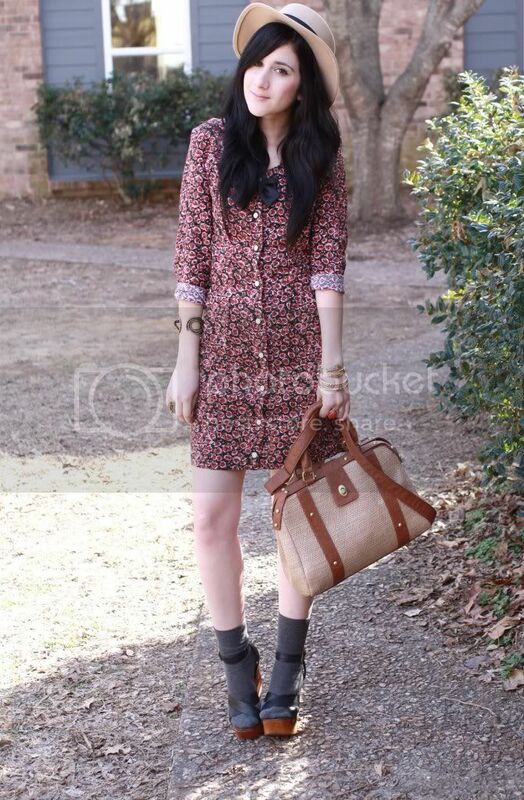 i love the shirt-dress style! the print is sweet, too! I adore that bag, it's great! It goes so great with your shoes too. And a question: how did you and your boyfriend meet? The other one: What's your animal? You are fantastic and the dress is fantastic! :-) Happy SV! you bag is so so beautiful! Love it! is great not to wear tights! love this springtime an love how you wear socks and shoes! the outfit is awesome expecially the dress. Cute bow& bangle. x hivennn p.s enter my giveaway? aaawwww...you look so lovely from head to toes!! love every bit of this outfit!! - Can you imagine your life without your blog? - Your best memory ur childhood? Adorable dress - love the little bow! Gorgeous dress!! I really like it! So pretty! 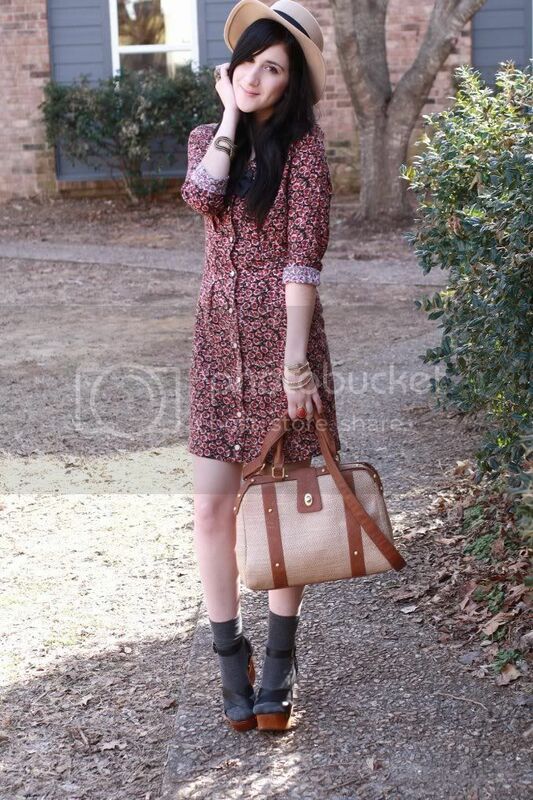 The dress is beautiful and I love how you styled the entire outfit! i love that dress and the bag! just awesome!!! Hi, I’ve just post on my blog an article with my favorite outfits for February, you’re in, if you don’t want I can deleted the picture and off course I’ve linked to your blog. Thanks Leah. Love your dress Bonnie! Happy V Day to you too (well, for yesterday). oooh so jealous of your weather (and outfit ofcourse :D), and cool that you're doing a vlog! Maybe tell us something about what you do in everyday life? Beautiful outfit Bonnie!!! LOVE that bag! Hope you had a great V-day! what a perfect look! Adorable dress! beautiful dress! and i love the bow that you added. hmm, question. i'd love to know about thrifting in texas. i went to dallas once and i don't know if it was just a bad day, but everything was so expensive and the selection wasn't great. is the area by you better? what make up do you wear? This dress looks so darling on you! And I am so jealous of your bare legs!! Excited for your v-log! Hmm, questions... what is a typical meal for you? your look is excellent! 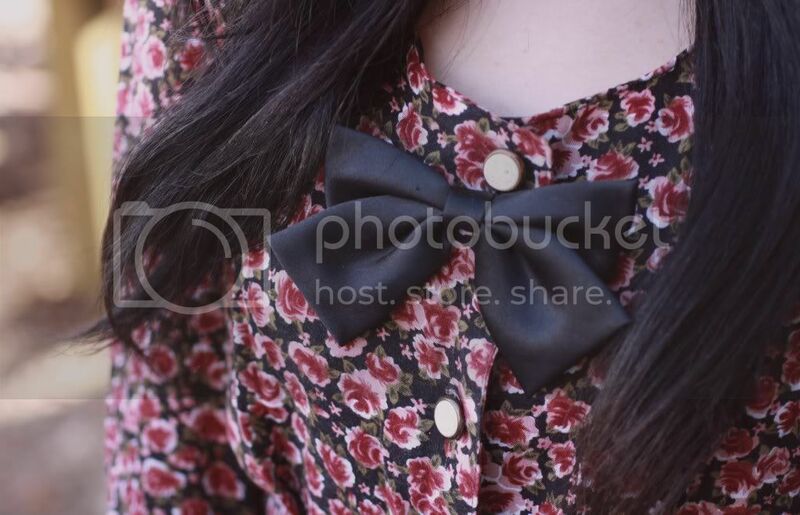 I love that floral pattern :) thnks for dropping by my blog! Do you have a big dream? What's that? If you could attend any fashion show which one would you see? This print is soooooo cute !! You look so beautiful.. hmm what else I can say ? PS Thank you for your lovely comment ! hello dear!! how are you?, i like your post!! the hat in these pictures is amazing, and fits in you so good. 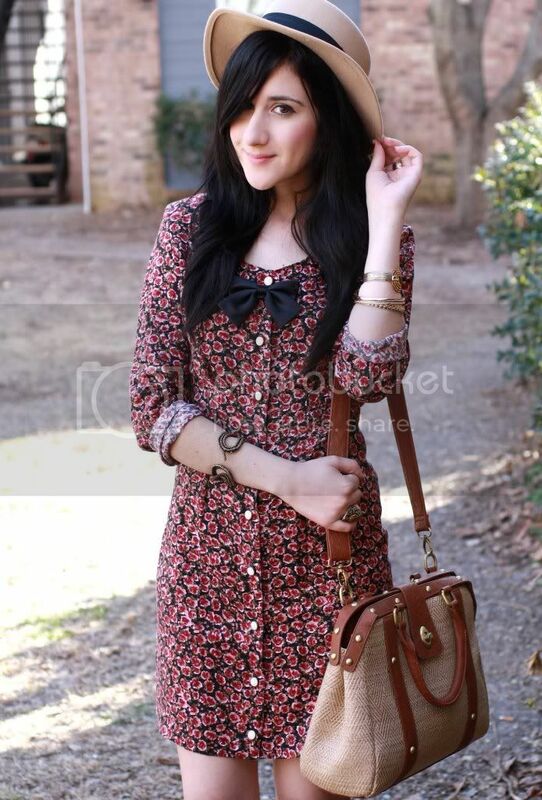 the flowered dress is perfect for you. This outfit is perfect! I think the vlog is a great idea - don't be nervous! As for the questions: How often and where do you shop? And just how huge is your closet to hold all those cute clothes? looking BEAUTIFUL! i love this outfit and probably would have freaked out if i had taken the pictures of it myself. beautiful dress - i love the print. Aww I love vlogs, I am so nosy about other blogger's voices, this will be nice! How do you feel about blogging and its community? sooooo unbelievably in love with this dress! That is such a pretty dress! It's so you! bonnie! your bag is gorgeous!! What kind of music is your favorite? Favorite band/s? Have you always been style conscious or is it a more recent love? Do you collect anything (besides clothes hehe)? I adore your shoes and the socks look so cute with them. the print on that dress is so pretty too. You always look so gorgeous in all you wear. I hope you know that! You look like you are straight out of a fashion magazine. Absolutely Stunning! the bow is fantastic and i also love shoes+socks, it's something i should do very soon cause i'm loving it so much lately! wow, i really love this dress. and ive got to say, you look practically identical to my 13 year old sister! its quite odd! also, your my FAVORITE fashion blog, you give me lots of ideas. im just starting up, but if you would like, check mine out! I love your dress! Wow! I love your dress and the black neck tie.